How do you select a PWD breeder? A show dog is an animal that the breeder feels conforms the most closely to the AKC/ PWDCA breed standard for the breed. (See AKC/PWDCA web site for the standard). However, dogs that have all the physical and mental attributes of the AKC standard at a young age may in fact not turn out exactly that way as they mature. Conversely, some dogs sold as “pets” end up fitting the AKC standard for the breed best. Breeders usually have a different contract and guarantees for “show puppies”. A puppy being sold as a “show” is one that the breeder and buyer have hopes of showing in the conformation ring to obtain an AKC breed Championship title. A dog that has a Champion title is generally considered a good specimen of the breed and worthy of reproducing. Dogs that have not achieved the Champion title have not been proven to conform to the breed standard and should not be used for reproducing. 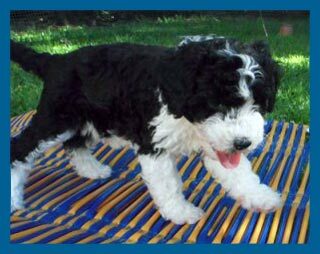 The puppy sold as a “pet” should match the criteria that sets it apart as a Portuguese Water Dog (not a poodle or golden retriever) but doesn’t match the AKC/PWDCA standard as closely as the “show” puppy. Pet quality puppies sold by reputable breeders will be given limited registration papers with the AKC. The breeder’s contract will call for spaying/neutering of these puppies at the appropriate age and they are not intended for breeding purposes. Any puppies produced by them will not be able to be registered by the new owners. How do you select a PWD puppy? Make sure the breeder is reputable: have they done all the health tests on their PWD dam and sire? Will the breeder provide you with all the health certificates and pedigrees of the dam and sire? Are their dam and sire meeting the PWD breed standards (do they have Ch. titles, for instance). Is the breeder a member of the PWDCA? If not, why not? How is the breeder raising the PWD puppies? Can you meet the dam and/or sire? At Mariner Kennel all our PWD puppies are raised in the house, amply socialized, bathed, groomed, and given their first set of puppy vaccinations as recommended by the vet prior to leaving for their new home. The litter is tested at 7 weeks by an outside evaluator for temperament and structure. All our PWD puppies are matched with the prospective puppy owner by assessing each family’s needs, goals, life style and activity level. We believe having a dog is a lifetime commitment and, therefore, is very important to fit the right puppy with the right home. Prospective puppy owners are welcome to see our Portuguese Water Dog puppies before they leave home and certainly to meet the dam. Often the sire of our PWD litter may or may not live near by with its owner. If the travel is not possible then pictures via internet are always a possibility. How do I get a Mariner Kennel PWD Puppy? Please feel free to email us at gone2dog@hal-pc.org regarding any inquires you have. If you are looking for puppies and we have some available at the time of your inquiry we will request to speak with you in person to find out more about what your needs are. We will request a non refundable deposit as recognition of your commitment to obtaining a puppy. Puppies grow up to be big dogs, so choose wisely. We look forward to hearing from you. Are there health issues with Portuguese Water Dogs? Mariner Kennel has always completed all available health clearances on the dams and never breeds our PWD dams with a sire that does not have all his health certificates. Copies of all health certificates are made available to prospective puppy owners. There are several important health factors to consider. Some issues such as GM1 (Storage Disease), and PRA (Progressive Retinal Atrophy) have tests that the breeder can do and assure the new owner no problems will arise. Other issues such as Canine Hip Dysplasia are more difficult to predict. Another health issue for PWDs is JDCM (Juvenile Dilated Cardiomyopathy). This condition results in lameness of the hind legs. It varies from mild to severe and each dog tolerates the pain that eventually is associated with the changes in the hips in different ways. The OFA (Orthopedic Foundation of America) has been certifying dogs free of hip dysplasia via x rays for 30 plus years. Unfortunately hip dysplasia in all breeds is poly genetic making eradication impossible up to this point. Even using parents that have Fair to Excellent Hip ratings will not guarantee that a puppy will be free of hip dysplasia, but it does reduce the chance of it occurring in their litters. For this reason, reputable breeders will only use parents of a litter that have passed OFA with a rating of at least “good”. At Mariner Kennel the dam and sire will have OFA certificates indicating they are free from hip dysplasia. Additionally the pedigree of the litter will show the hip status of the other relatives to the puppy. Mariner Kennel does not breed to dysplastic dogs and strives to have pedigrees with breadth and depth in regards to non dysplastic dogs. In this regard we try and make an impact on the future health of the breed by breeding away from known health problems. What is GM1 (Storage Disease)? Puppies that test positive for this problem do not live to maturity. That is why PWDCA requires this for PWDs. There has been a genetic test for this problem since the late 1980’s indicating the mode of inheritance was a simple recessive gene, and this health issue may be under control at this time. However, it is prudent for prospective buyers to make sure that the GM1 test has been performed on the dam and the sire, and that both have Normal results. This health issue is a problem in numerous other breeds but thru hard work and persistence the PWDCA and member breeders diligently worked to obtain research to determine the mode of inheritance. It was found to be caused by a simple recessive gene and there has been a test, the Optigen Test, for PRA for the last several years. Dogs are rated as normal, carriers or affected. Only affected dogs will develop blindness, usually in older age. Dogs that are normal or carriers will have no vision problems due to PRA, but they may transmit the disease to their litters. PWD’s are susceptible like most breeds to other eye problems such as cataracts, detached retinas etc. Most of these issues do not occur with any high incidence. An evaluation by a veterinary opthmalogist is useful to determine any of these other eye problems. What is Juvenile Dilated Cardiomyopathy (JDCM)? This health issue is also in a number of other breeds. The mode of inheritance is not known but research on this problem is being tackled by several breeds. Puppies affected by this disease will not reach maturity. What type of training should you do with your PWD? We at Mariner Kennel strongly encourage all dog owners to invest mostly time and effort in taking your dog to obedience classes. It is best if you take your dog to a local class offered by an obedience club or private instructors as they offer better programs with better trained instructors than commercial pet stores. We believe it is important to train with the dog: the dog needs to learn to mind and respect you. Remember you have to live with the dog. Training will not only create a better bond between you and the dog but also will make you and the dog understand the rules and needs of each other better. Be sure to involve the whole family so every one uses the same commands and sets the same limits for the dog. If you get really hooked you can always try competitive obedience, agility or tracking with your dog.